When it comes to fun and excellence, we believe that Trampolines are just the greatest invention for families and athletes alike. We want to offer more exposure for the acrobatic sports and provide a place where everyone of all levels of expertise can learn more about the construction and use of trampolines. 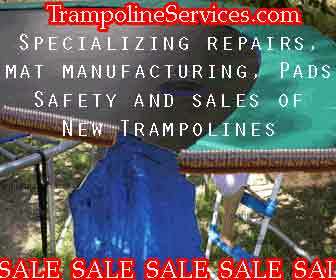 US-made trampolines, mats and other items are often featured on our site and we proudly cheer on our American athletes. Our advertisers are very important to our site and we hope you will visit them by clicking on the image ads on this site. We wanted to create a online place where people could get information on trampolines of all sizes and the benefits of using these trampolines. You can evaluate the costs, benefits and quality of different products, see the results of Texas gymnastics teams, and view online links to resources like videos and more! We appreciate your suggestions and welcome contributions to the site. We encourage you to contact us, via email, and let us know what you think - submit your team results and rankings, or provide us your favorite family trampoline game! 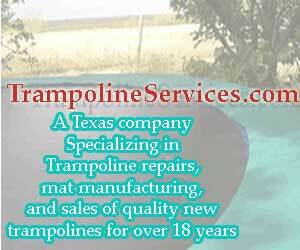 Thank you for visiting Trampoline Town and we hope you'll enjoy the information on this site about the always-fun trampoline! Note: The opionins represented herein are those of the individual authors and not the owner and publisher of this website.